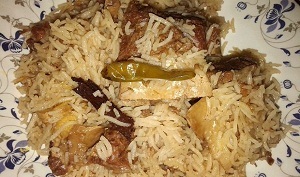 Yakhni Pulao is a main course meal, prepared with rice and yakhni of meat (usually mutton) and some other spices like cloves, chillis, onions and cumin. The addition of star anise and nutmeg in yakhni pulao gives it a great and scrumptious aroma which increases the appetite. Some people add green chilli paste to yakhni pulao for a spicier taste. The essential ingredient of yakhni pulao which gives it a flavour and aroma is fennel and coriander seeds. While cooking this recipe, yakhni is permeated into rice which is the actual speciality of the dish. You can serve yakhni pulao with mint or cumin raita. Garnish yakhni pulao with brown onions and mint leaves. This is a traditional recipe of Punjab. If you cook it with perfection, its taste will beat all the other rice recipes. Here is the recipe of yakhni pulao by Chef Shireen Anwar. 1. Soak rice in water for half an hour. Than Cook mutton with garlic cloves, green chilies, little bit salt and water till tender and so much so that it left with 2-3 cups of stock in it. 3. Add white cumin, black cumin, cinnamon sticks, star anise, small cardamoms, big cardamoms, cloves and black pepper whole and add meat in the pan, without stock. Fry for 3-4 minutes and add yogurt, cook for 4-5 minutes. 4. Measure 7-1/2 cups of stock with water and pour in the pan. 5. Add soaked rice too, without its water. Cook for 5 minutes on a high flame and on a low flame for 10 minutes than turn off the stove and let it be placed on the stove for 5-6 minutes for DAM. Now its ready to Serve with garnishing. Although I do not like yakhni pulao, but all the people in my family loves it. Therefore I need to learn it and I tried the recipe of yakhni pulao mentioned here on this page. It really came out nice and aromatic. I made this yakhni pulao for my husband because he is a big fan of yakhni pulao. He gave a 5 star to this recipe. I will share it with my friends too. It is quite an easy recipe for yakhni pulao. When I grew up as a child in Pakistan, I always enjoyed this wonderful festive rice which was served at weddings or other special occasions. Also good with Shami Kabab. Eat it along with chicken curry as well. Whenever we make something related to rice, I always ask or request my parents to make yakhni pulao because I feel like yakhni pulao has more taste than the usual biryani. I love yakhni pulao because it combined with mutton meat is just simply delicious. I've unable to stop myself from finishing the full kg myself.